Arthritis and neurological disorders can both contribute to nerve damage of the peripheral nerves, a condition referred to as peripheral neuropathy. The damage can lead to decreased or abnormal sensations. 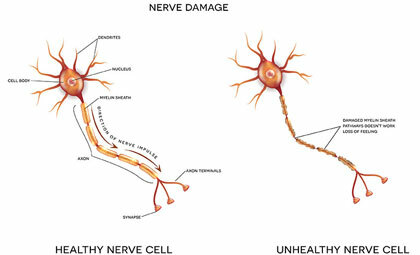 Nerve conduction velocity (NCV) tests can measure the degree of damage in large nerve fibers, revealing whether symptoms are caused by degeneration of the myelin sheath or the axon. During this test, a nerve fiber responds by generating its own electrical impulse when it a probe electrically stimulates it. Electromyography (EMG) involves inserting a fine needle into a muscle to record electrical activity when muscles are at rest and when they contract. EMG tests can help differentiate between nerve and muscle disorders, and also helps differentiate abnormal electrical activity. Nerve biopsy involves removing and examining a sample of nerve tissue, most often from the lower leg. 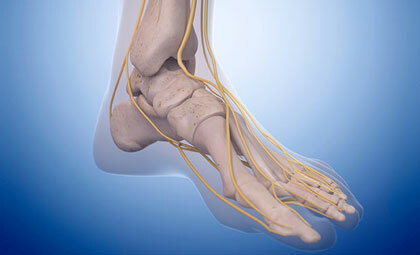 This is an invasive procedure that is difficult to perform and may cause neuropathic side effects. Skin biopsy is a test in which doctors remove a thin skin sample and examine nerve fiber endings. This test offers some unique advantages over NCV tests and nerve biopsy. Seeking treatment is very important. Without treatment, more serious issues can develop. Regular exercise can help to improve blood flow and your doctor may recommend ointments and medication to reduce inflammation and pain. Massage, physical therapy, and electrical nerve stimulation can all help to improve nerve function. Since peripheral neuropathy is most common among diabetics, inspecting feet regularly and monitoring blood sugar levels is an important part of managing symptoms and preventing further damage.